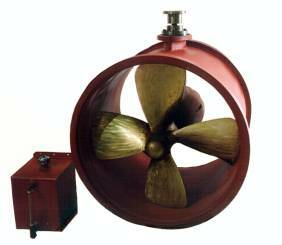 Harbormaster Marine was a pioneer in the development and application of Bow Thrusters / Tunnel Thrusters to commercial vessels. Initially used in the bows of ferries and tugs, these versatile control devices soon became popular in offshore oil servicing boats and larger ocean-going craft. They permit unassisted maneuvering alongside of oilrigs, vessels, loading platforms and docks - and provide precise control at slow speeds through locks, narrow channels and bridges. Today, Harbormaster Bow Thrusters / Tunnel Thrusters are found in applications all over the world where precision vessel control is needed. The Harbormaster Tunnel Thruster is installed athwartship in a tunnel low down in the bow. Sometimes a second unit is installed in the stern. For dynamic positioning and station keeping, as many as five Harbormaster Tunnel Thrusters have been used in a single application. With 180° thrust --90° to either port or starboard -- the Tunnel Thruster gives added maneuverability and control for docking and slow-speed operations. Because the Harbormaster Tunnel Thruster is relatively small in its awthwartship dimension, it can be installed in a ship with fine entrance lines and can be located in the optimum position for maximum turning moment. Complete overhaul, maintenance and removal of the mechanism are often accomplished without dry-docking. This BT-400 replaced an existing Tunnel Thruster. It has a custom length thruster with specially sized mounting/adaptor rings to greatly simplify the installation. Existing athwartship tubes can be used without the need to reposition them. 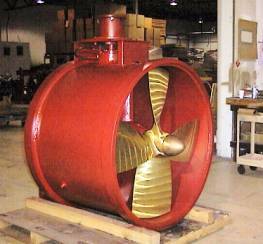 Harbormaster Marine manufactures the Bow Thruster / Tunnel Thruster with an input flange in either the vertical or the horizontal position. Customer-supplied power may be in the form of a diesel engine, gas turbine, electric motor or hydraulic motor. Four models cover a wide variety of HP and RPM ranges, with diameters from 36" to 120". Azimuth and through-the-hull thrusters are also available. 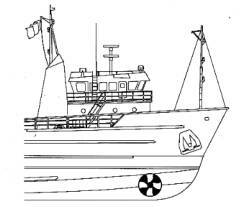 The Harbormaster Bow Thruster / Tunnel Thruster consists of a cylindrical weldment, supporting near its center a right angle gear box with input shaft, coupling, and propeller shaft, and a Kaplan type propeller with blades working in close proximity to a corrosion and abrasion resistant wear ring. Forged steel shafts are mounted on tapered and straight roller bearings. Drive gears are case hardened, spiral bevels designed for shock resistance, long life and quietness. Complete drive mechanism lubrication is through a flooded system, the entire Bow Thruster / Tunnel Thruster gearbox running submerged in oil. The gearbox, connected to a gravity tank 10 feet above the load water line, is equipped with sight gauges to show the thrusters oil level and give visual proof of tightness of seals, which keep water out of the mechanism. Shaft seals are the positive face type and rarely need replacement. Bow Thrusters / Tunnel Thrusters are normally operated only for limited periods during docking and maneuvering, however we build them for rugged service by using many of the same components as our continuous-duty Harbormaster Outboard Drive Units. Helical-cut gear sets are constructed from steel forgings that are lapped and matched after grinding. This provides extra long life and reliability. A Dimension 13.5 in. 15.0 in. 15.5 in. 18.25 in. B Dimension 36.7 in. 42.75 in. 49.0 in. 61.0 in. C Dimension 26.5 in. 31.19 in. 31.19 in. 29.75 in. D Dimension 33.25 in. 39.81 in. 39.81 in. 54.25 in. E Dimension 42.63 in. 50.81 in. 50.81 in. 76.63 in. 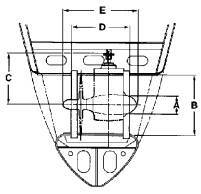 NOTE: For other capacity Bow / Stern Thrusters, contact Harbormaster Marine, Inc.
To view additional Bow / Stern Thruster specifications, click on the Model link ABOVE. Copyright © 2007 Harbormaster Marine, Incorporated. All rights reserved.